Building a cohesive, productive team takes work, but the payoff can be huge—for each of the individuals, the team and the organization. 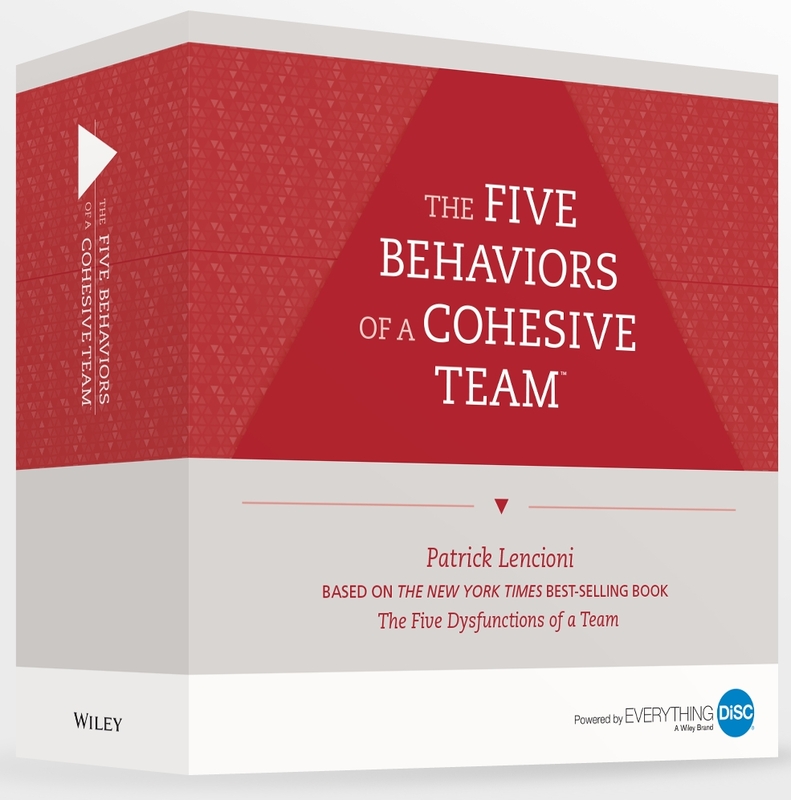 The Five Behaviors of a Cohesive Team™ is a comprehensive team development program based on the international best-selling leadership fable, The Five Dysfunctions of a Team by Patrick Lencioni. This assessment-based program helps team members and leaders understand how their unique group dynamic can work together to build a more effective team and achieve sustainable results. This program has a very simple goal: To facilitate a learning experience that helps all professionals and their organizations discover what it takes to build a truly cohesive and effective team. The Five Behaviors program utilizes workplace personality assessments to help participants understand the personalities on their team and how they can effectively work together. Two versions of the program are now available: Powered by Everything DiSC® or All Types™—two distinct personality models—which help participants understand how individual personalities contribute to team development. Both are equally valuable in helping teams achieve greater effectiveness and productivity. The Five Behaviors Profile provides both individual and team feedback. Participants will learn how, as a team they score on the key components of the model: trust, conflict, commitment, accountability, and results. Participants will be able to create a better, stronger team using these results. This program takes self-awareness to the next level—across all workplace teams and business environments. The Five Behaviors of a Cohesive Team Program helps both team members and leaders understand how their unique group dynamic can work together to build a more effective team and achieve sustainable results. Participants will come out of the training not just with knowledge of the model and of how the team is currently performing, but also with specific plans to improve that performance. Bringing together everyone’s personalities and preferences to form a cohesive, productive team takes work, but the payoff can be huge—for each individual, for the team and for the organization. The Five Behaviors of a Cohesive Team Profile - Powered by Everything DiSC is a rich and powerful report. Each individual will respond to questions about their personal preferences (Everything DiSC), and questions about the specific team. The report that is generated for each person contains both their individual data and team data. The Five Behaviors of a Cohesive Team™ - Powered by All Types™ is designed exclusively for teams within organizations that apply tools based on Jung’s theory of psychological types, like the MBTI® instrument, as their preferred indicator of personality. This program creates a learning experience that helps teams understand how they score on the components of The Five Behaviors™ Model: Trust, Conflict, Commitment, Accountability, and Results, and discover how individual personalities and preferences contribute to the team’s overall success. Team members need to have a meaningful understanding of themselves and their peers, which is why this 37-page report gives insight into each team member’s personality type using all Types™. For teams and individuals to build a more effective working relationship, it’s important that they continue to grow in the five behaviors: building trust, mastering conflict, achieving commitment, embracing accountability and focusing on results. 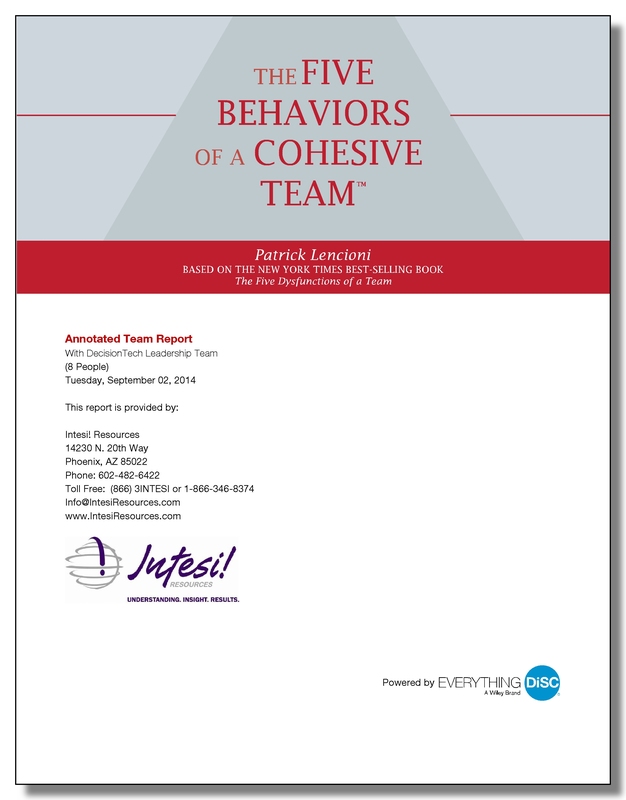 The Five Behaviors of a Cohesive Team Progress Report offers insight to just that. This report measures team progress by graphically comparing how a team’s performance changed over time. This Progress Report highlights areas of greatest improvement and decline, offers productive points of discussion, and provides an action plan to help teams prioritize and set specific goals. The Progress Report is designed especially to show a team how its behaviors have changed as compared to the last time the team was assessed. In addition to showing the improvements on the team, the report outlines challenges that may be hindering further development. For facilitators who are ready to take the next step in the Five Behaviors journey in their organizations, we have a new tool for you - The Annotated Progress Report (for the facilitator). The Annotated Progress Report is a personalized report specifically for the facilitator. The report will help you understand how to use The Five Behaviors Progress Report by giving you a snap shot and insight into your team's scores. This new report is filled with data to help you better manage a Five Behaviors session. The Annotated Team Report is used by the facilitator when preparing for a team session. It will take the facilitator through the report page by page, giving pointers and some extra information along the way. The team information that appears on the profile pages in the report is accurate; it is the same information that appears in the participant reports. In addition, an appendix includes a ranking of all assessment items by team average and the team’s percentile for each of The Five Behaviors. Everything you need to successfully facilitate The Five Behaviors of a Cohesive Team™ sessions. This kit includes a USB drive installed with a Facilitator’s Guide, which includes scripted sessions and experiential activities; presentation materials; handouts; PowerPoint slides with 40+ minutes of video; and sample reports to help facilitators prepare for team sessions. Also included are audios that allow you to listen to insights on each of the five behaviors, the team profile, and the Annotated Team Report. This program is fully customizable. Create an end-to-end teamwork development program or concentrate on specific areas. Switch out video clips and modify the Facilitator’s Guide, PowerPoint® slides, and handouts. Add or delete sections to fit any time frame. Please note: team member profiles are purchased separately. Seven modules from 1 to 3 ½ hours in length. Each module includes: Facilitator's Guide in MS Word, Participant handouts in MS Word and PowerPoint with embedded video. The fully scripted Facilitator’s Guide includes supporting presentation materials and participant handouts. Through the use of experiential activities, video, and discussion, an intact team is lead through the powerful The Five Behaviors model, learning and practicing the behaviors that will make the team more cohesive and improve its performance. Listen to audio podcaststo hear first-hand how to interpret The Five Behaviors reports so you can easily and thoroughly answer participant questions. Contains insightful information from our Director of Research that you can’t find anywhere else. The podcast is broken up into short clips that cover The Five Behaviors model, the team profile, and the Annotated Team Report. The Five Behaviors of a Cohesive Team is one of the most powerful and productive learning programs ever. This program is different--emotional and sometimes turbulent, The Five Behaviors of a Cohesive Team can simultaneously be extremely rewarding and a challenge to facilitate. As a facilitator you can influence whether a team sees an uncomfortable moment through or misses out on the opportunity to grow. Prepare for the demands of leading The Five Behaviors sessions and join the in-demand group of accredited team building professionals. This intensive five-week blended learning course will prepare you to more effectively facilitate The Five Behaviors of a Cohesive Team facilitator program, including teaching you how to create and deliver a custom workshop. The self-directed online work includes interactive activities to help you absorb the principles of The Five Behaviors model. During the live sessions, you will practice facilitating activities with small groups and explore challenging “what-if” scenarios that could come up during your workshops. The Five Behaviors Facilitator Accreditation will give you the tools and confidence you need to master this amazing program no matter what a team brings to the room. Want to learn more? I’ll be glad to walk you through the details of the course, share my own experience as an Accredited Facilitator, show you the curriculum, and expedite your enrollment. Just email me or give me a callToll Free at 866-346-8374.